Every planet has its secrets, especially the events of its youth billions of years ago. However, patterns of atoms in tiny fragments of ancient crystals can reveal some of those secrets – the date of events such as giant meteorite impacts. Researchers from Western University and the University of Portsmouth made the discovery using the 150-km (93-mile) wide Sudbury crater as a test site. Shock waves from the impact of the meteorite that formed the Sudbury structure almost two billion years ago also deformed the minerals that make up the rocks beneath the crater. Some of the smallest crystals (like the micromineral called baddeleyite) are the toughest, and they contain trace amounts of radioactive uranium and the stable “daughter” product, lead. New techniques can now take a microscopic crystal fragment and measure the age of the rock, the timing of crater formation and even later crater warping in a mountain-building event. The work is thanks to an international team using specialized instruments for finding and measuring mineral nanostructure at Western’s nationally unique Zircon and Accessory Phase Laboratory (ZAPLab), including a new instrument called the atom probe. “Using the atom probe to go from the rock to the crystal to its atomic level is like zooming in with the ultimate Google Earth,” Moser says. Moser points out that the force of a meteorite collision can be “Earth-sterilizing,” in that it melts the surface of the planet and causes oceans to evaporate. That timing is central to understanding the formation and evolution of planetary crusts and the habitability of planets. The main information about time comes from the radioactive decay process. 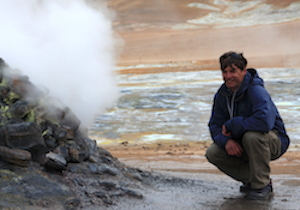 Dr. Moser looks for samples in Iceland to compare to the Martian meteorites he studies. Conventional techniques involve destroying and mixing most of a grain to measure the uranium and lead. However, damaged domains in the mineral can allow some of the lead to move out, resulting in a false “mixed” date that doesn’t correspond to a real event. The new atom probe tomography technique combines special equipment at the ZAPLab and CAMECA Laboratories in the U.S. to go in at the microscopic level. The instrument can then slice and lift out tiny pieces of baddeleyite, which is common in terrestrial, Martian and lunar rocks and meteorites. Shock waves from meteorite collisions will twist and sometime scatter the atoms in recognizable ways. Moser’s team – including PhD student Lee White and co-supervisor Dr. James Darling of the University of Portsmouth – measures the deformation in the crystals after sharpening and polishing the pieces into extremely fine needles, then evaporating and identifying the atoms and their isotopes layer by layer. The result is a 3D model, much like a CAT scan, of the atoms and their positions. The team’s findings, published in the journal Nature Communications, reveal domains of different uranium-to-lead age that match the history of the crust of northern Ontario. They also show fascinating clustering of impurities into ripples, possibly created by the shock wave. 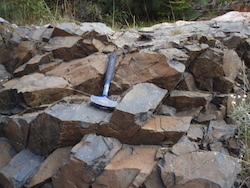 The outcrop at the Sudbury crater, where Moser’s team obtained crystals of baddeleyite. Moser’s fascination with planetary science goes back to growing up in southern Ontario, searching the night skies with his telescope. He became interested in giant meteorite impact structures more than 20 years ago when visiting the largest such structure on Earth in South Africa (Sudbury is the second largest), and has active research projects investigating them in the Americas, Africa and Europe. 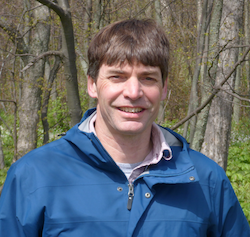 Moser feels the research opens up a new world for studying planetary history.